The feature list alone: die-cast hoops, Star-Cast mount, great finish, fab hardware, is enough to push the Superstar into £1,000-plus territory on paper. Add to that the fact that the Superstar sounds superb and is so well finished, and it's hard to see just how Tama can deliver it at the price it does. But let's be thankful that it can. The ante, it would appear, has been upped yet again. This kit sports outrageously good looks and has a really professional feel. Limited Edition really does mean limited – so if you want one you'd better get searching! The Superstar is aimed at players working in high volume settings. The Superstar has already proved a super-seller. In terms of fatness, the Superstar kick is pretty well spot-on. Die-cast hoops, Star-Cast mount and fab hardware. The snare works beautifully when tuned high. Comes with cracking big 16" and 18" floor toms. Finished with sparkling gold glitter wrap. There's a bit of magpie in all of us. I'm not suggesting that somewhere along the evolutionary time line our DNA got mixed up with that of the black-and-white be winged ones, but there's no doubt that we're all drawn to a bit of sparkle. From diamond ear studs to flash metallic car finishes, all that glitters might not be gold, but it's always glorious. The reason for breaking out the glitter wrap here is to clothe Tama's new Superstar Custom EFX Ltd Ed set - a short-run kit (with lovely big sizes that run 24"x18", 12"x9",16"x16",18"x16" and 14"x6½") that slots in at the top-end of the brand's extremely popular mid-range series. The Superstar has already proved a super-seller, so let's hope this one isn't just a pretty face. Ignoring the hard-to-ignore Vintage Nickel Sparkle finish for a moment, beneath the wrap lurk birch/ basswood shells. The inner plies are of birch selected, as ever, for its edgy, projective character, while the inner and outer plies are basswood, which generally has nicer-looking grain (not that this matters where wrapped kits are concerned of course). 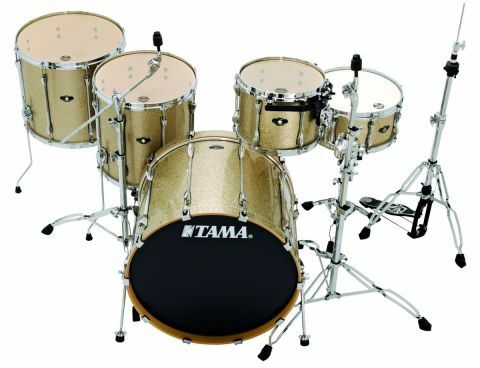 On the evidence of the review kit, the shells are a credit to Tama's quality control, displaying exemplary standards of construction and finishing. The bearing edges are wonderfully consistent and the internal surfaces are clean and tidy, both aspects that instill confidence in the package as a whole. Things only improve as other features are ticked off the list. Die-cast hoops crop up on all drums, and while they might arguably be a subjective choice, there's no doubting their pro-end connotations. In theory they'll also contribute slick tuning and a focused, ready-to-go tone, allowing some high-end performance at a less than crippling price. So we are very happy at their inclusion here. The high-tension Sound Bridge lugs that Tama has developed for the Superstar are also very likeable. The retro-style long lugs only touch the shells where the nutbox is situated, with the body of the lug being raised just off the drum itself. So the benefits of reducing tension on the shell, and the extra protection that the metalwork provides, exists without inhibiting resonance. It's all good so far. We continue in the same vein with the unsubtle but well-proven Star-Cast mounting cradle appearing on the rack tom. A feature that will be familiar to many, the cradle is also used for Tama's flagship Star classic toms and is affixed to the tom separately from the tuning rods, so head changes can be done with the cradle still in place. It's a simple design that works. Its slightly agricultural looks have long since passed into The Hall Of Cool, so we can ignore that fact that the Star-Cast is essentially a whacking great bit of bent black metal secured to your beautiful drum with three bolts. The rack tom here is mounted on a single tom arm, which attaches to any handy cymbal stand with a rather excellent clamp. We won't waste words here trying to describe how the thrappet is fixed to the knurled grommet-washer by a self tensioning U-bend. But trust us, the obvious time and effort dedicated to little details like this mark the Superstar out as something rather more special than its price tag suggests. And, of course, it makes for easy positioning of the most important tom in the kit. The depth of the kick drum implies plenty of low-end weight, which is just what we get. There are louder bass drums, but in terms of fatness, the Superstar kick is pretty well spot-on. It's also very well tamed - we used it primarily undamped with the unholed front head 'as is' and the damped batter head did a fine job of keeping everything in shape. You'd want more fine tuning options when on stage or in the studio, but straight from the box the drum provides a great foundation tone. The story's the same with the cracking big 16"and 18"floor toms too. Bags of oomph and thunderous bottom are countered by easy tuning that prevents wayward frequencies from creeping in. These are not drums for jazz or funk, clearly, but for sweaty rockers they'll prove addictive. You do need to work them though -and if you're lighter of touch then smaller sizes will suit you better. But anyone will get on with the 12"tom and snare. The latter works beautifully tuned high for fluttery funk ghost notes, but always delivers an immense backbeat when required, thanks in part to the cast hoops. And the generous size of the drum encourages lower tunings as well -these stop short of ever sounding tubby (within reason anyway) and instead assume a wallop and muscularity that Grohl fans will drool over. Perhaps more than any other feature, the size of the drums that make up a kit dictate who it's going to work best for. And, as with any kit sporting 16"and 18" floor toms, this particular Superstar line-up won't slot easily into hip-hop, church or jazz ensembles. It's obviously aimed at players working in higher volume settings than that. And for them it'll work a treat. But don't despair if you're a tad more graceful with your backbeats, a little more restrained with your right foot - there are several other Superstar Customs that are aimed right at you. Celebrations all round, then.